And what's Chinese New Year without a Dragon and Lion Dancers, right? Catch the Dragon and Lion Dance show at the Atrium at Evia Lifestyle Center at 4:00 PM on January 28. 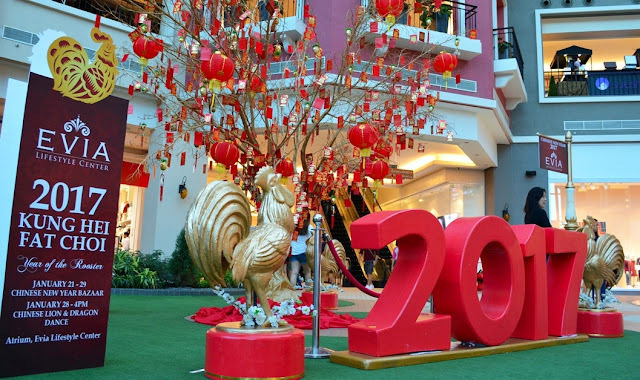 You can also have your photo taken beside the Money Tree that symbolizes wealth and prosperity, or even shop for lucky charms at the Chinese New Year Bazaar which is located at the Atrium beginning January 21 - 29, 2017. There's also a fireworks display to welcome in the Year of the Rooster on January 28 at 6:30 PM at Evia Lifestyle Center Outdoor Promenade. In ancient times in China, there is a belief that the presence of a Lion or a Dragon drives away evil spirits and chases negative energy away that it why the practice is still observed till today so that businesses and even residential homes will attract good luck. Giving of red envelopes or Ang Pao that contains money is also observed since it symbolizes happiness and good luck for both the giver and the recipient. So make sure to have your photo taken at the Money Tree to have a remembrance of good fortune the whole year. These and more can be found and experienced at Evia Lifestyle Center from January 21 - 29, 2017. Kung Hei Fat Choi !! !